Imagine having access to the warm tube growl of a Rhodes® Suitcase model, the punch and presence of a Wurlitzer® 200A or the funky percussive tones of a vintage Hohner® D6 Clavinet. These classic electric pianos and electronic keyboards produce some of the most distinctive instrument sounds — tones that have graced and defined everything from mega pop hits to jazz standards to classic rock and more. Now these sounds can be yours — in an app! With iLectric Piano you can perform with some of the world's most revered vintage instruments, all painstakingly recreated down to their most subtle nuances. 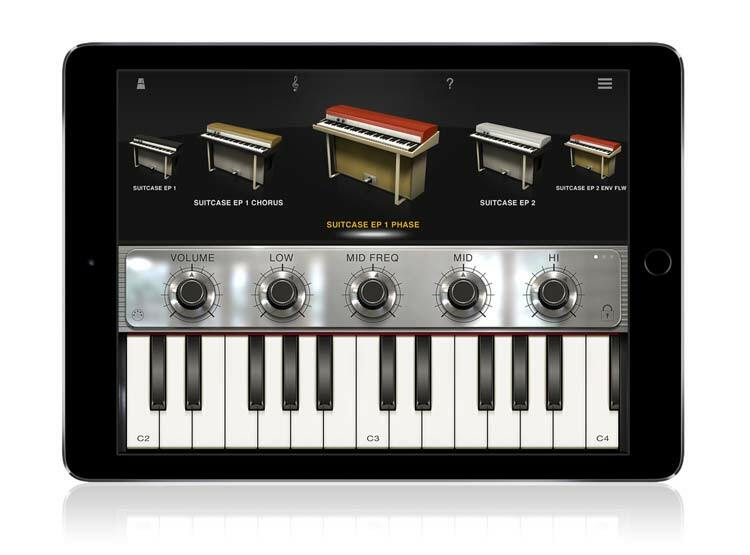 You get a veritable "who's who" (or perhaps we should say a "what's what”) of authentic sounding classic electric pianos and keyboards, all inside your iPad. Coupled with one of IK’s iOS keyboards, MIDI interfaces or other MIDI-compatible devices, iLectric Piano becomes a killer ultra-portable mobile setup that lets you make professional-quality music anytime and everywhere. All 19 instruments that come with iLectric Piano are authentic, rich and warm. When you connect your mobile device to a speaker or headphones, close your eyes and listen, you'll think you're listening to the real deal. And you are. The included instruments feature a wide variety of sonic textures, ranging from luscious and ethereal to sharp and funky to down, dirty, and distorted. You get multiple versions of "EP" and "Wurly," which were sampled from the two most iconic electric pianos of all time. And there are three different Clavinets in the collection, giving you many variations of the funkiest of all keyboards. And that's just the beginning. 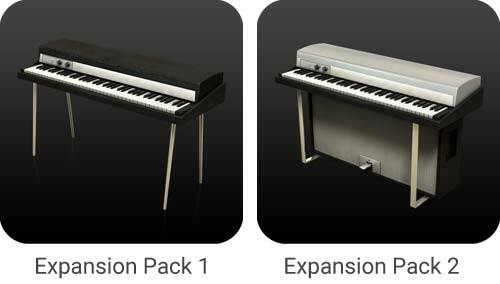 iLectric Piano is expandable via in-app purchase with two sound packs that each can add 22 vintage and modern keyboards to your collection — making for a massive total of 64 total instruments!. How do we provide such accurate emulations? We started developing new technologies to accurately reproduce the most realistic and "true-to-the-original" sounds of vintage instruments over 16 years ago. And while we can't give away all of our secrets, we can tell you that every note produced by each instrument was painstakingly sampled at multiple velocities (if you're not familiar with the terminology, velocity is a MIDI measurement of how hard you hit the key). The multi-velocity sampling is a key factor (no pun intended) when you’re playing iLectric with a velocity-sensitive MIDI keyboard, like our iRig Keys Pro or iRig Keys. Hit a key softly, and a soft sample is triggered, hit it a little harder, and a harder one is triggered, and so forth. With this type of dynamic response, the iLectric instruments offer an extremely true-to-life playing feel. iLectric Piano is equipped with an ultra-low latency engine, which means that notes sound immediately when you hit a key, further adding to the realistic playing feel. You won’t experience any of the annoying and distracting latency delay that you find on many instrument apps. In addition to the incredibly accurate reproduction of each instrument's original character and sound, we provide you with some modern tools to make the sounds your own. We added a powerful effects section to give you the creative tools to take the original sounds to a completely new level of originality and unique auditory bliss. And they're easy to use. 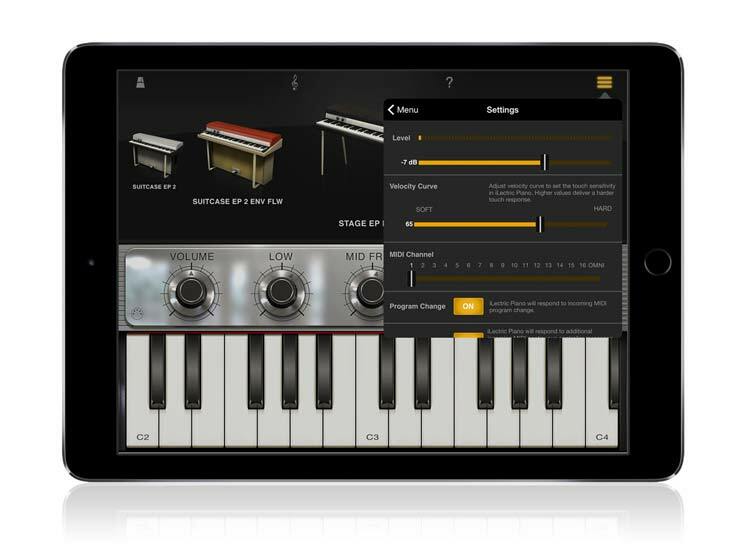 When you first open the app, you’ll notice the 3-band EQ conveniently located just above the keyboard. There are low- and high-frequency adjustment knobs (boost & cut), and two knobs for midrange: one that sets the mid-point frequency and one that boosts or cuts based upon the position of the frequency selector. Now swipe the control area to the left, and you’ll find more effects for your tweaking pleasure. The ultra-smooth Reverb adds ambience and depth. There's an overdrive, which, unlike a standard guitar-type overdrive, is tailored specifically for capturing authentic electric piano textures. Set it low for a subtle, tube-like warmth, or crank it for an overdriven, edgy cabinet tone. Finally, there’s the Modulation section, which gives you five different effects choices: Chorus, Phaser, Flanger, Tremolo, or AutoPan. You can adjust speed and depth for any of them, and your settings stay in place when you switch between the different mod effects, making it really easy to compare them. Go from subtle to crazy, depending on where you set the controls. In addition, iLectric Piano now features a variations system that lets you save your tonal adjustments to one of four conveniently placed buttons that sit just next to the knobs themselves. So imagine you’re playing one of the cool instruments in iLectric Piano. Let’s say you choose “Wurly Suitcase,” and its awesome authentic tone is inspiring you to push your playing to the limits, or maybe come up with a really cool melody line. iLectric Piano’s recorder is right there, ready to go. There’s no need to stop playing, turn on your computer, connect your iPad, launch your DAW, set up and name a new file, setup the right kind of track, and then try to remember what you were playing that so inspired you. With iLectric Piano, the recorder is just a button push away, making it easy to immediately capture your inspirations. Set the metronome if you want to (it even has a Tap Tempo feature), hit Record, and you’re rolling. You can even overdub as much as you want, layering over your original part, and you can easily export your recordings as audio via File Sharing, email or Copy. Here’s another cool feature. When you’re in the Record window, pressing the little keyboard icon gives you an alternate keyboard view, which shows you the full keyboard. When a recording plays back, the sounding notes are highlighted in real-time, which can be a great way to see how something was played. With iLectric Piano you're in complete control. And while you can use the onboard touchscreen keyboard to play your sounds, the real fun starts when you explore IK's world of external input options. 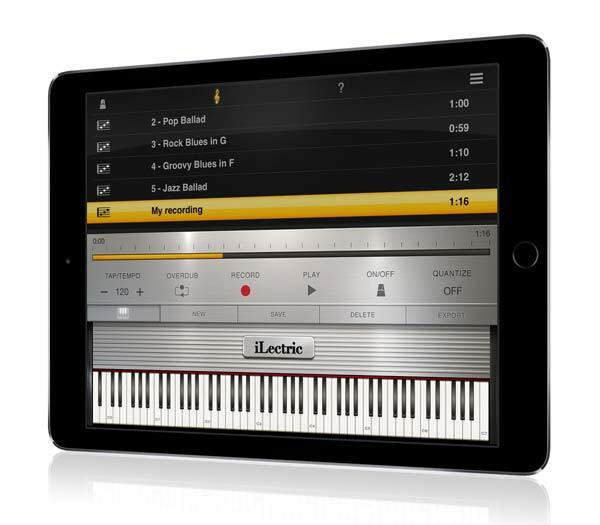 iLectric Piano is also compatible with Inter-App Audio and Audiobus (a third-party app that requires separate purchase) in iOS 8 and above. That means you can send its output through other audio apps — like AmpliTube, GarageBand and many others — to be filtered, recorded, looped and more. The ability to share audio between apps opens up the potential for incredibly creative possibilities. iLectric Piano also supports background audio, which means it can play in the background when other audio apps are playing in the foreground. This allows for even more layering opportunities and the potential for extremely unique audio combinations. 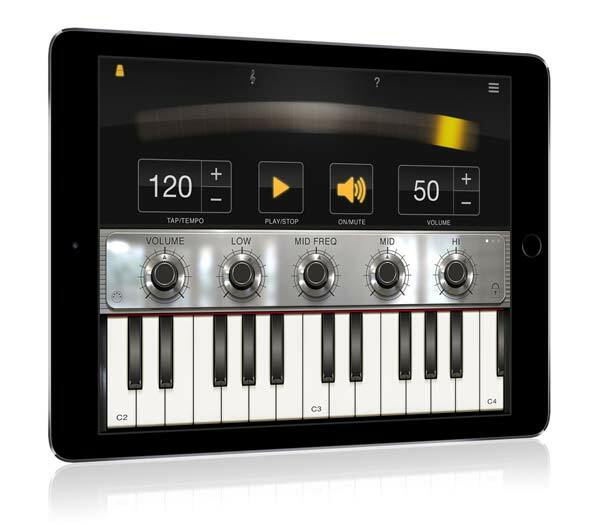 Download iLectric Piano today to experience what its world of sounds inspires in you. iLectric Piano™ is a trademark property of IK Multimedia Production Srl. All other product names and images, trademarks and artists names are the property of their respective owners, which are in no way associated or affiliated with IK Multimedia. iPhone, iPod touch, iPad, GarageBand, Mac and the Mac logo are trademarks of Apple Computer, Inc., registered in the U.S. and other countries. App Store is a service mark of Apple Inc. Samsung, GALAXY Note® 4, GALAXY Note® Edge, GALAXY S6, GALAXY S6 Edge and GALAXY S5 are all trademarks of Samsung Electronics Co. Android is a trademark of Google Inc. Google Play is a trademark of Google Inc.
Rhodes® is a trademark of Joseph A. Brandstetter. Wurlitzer® is a trademark of Bank of America, National Association. Yamaha® is a trademark of Yamaha Corporation.